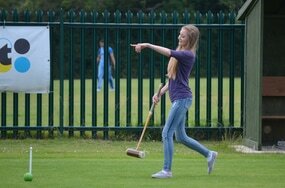 Welcome - Come and Try Croquet! We ​welcome newcomers every Friday Morning and Saturday Afternoon, from April through to the end of September. ​ Just turn up at one of these times. A Club member will be here to show you the ropes, and make you a nice cup of tea or coffee. No dress code, no experience necessary. All equipment provided. And it is Free! (larger groups 6+ excepted). and meet us at the Club.